The GeoN Marine water sampler is used for water/gas sampling in open systems such as drilled holes, open pipes, mine shafts and in lakes. No filter tips are used. Similar to the GeoN Groundwater Sampler, the GeoN Marine water sampler carries an evacuated glass vial. The sampler is connected to a plastic activation tubing and is lowered down into the water and further down to sampling depth. The tubing is connected to an air pump and is pressurized to approx 4 bar. A pneumatic activation unit drives the vial approx 1” downwards inside the sampler. 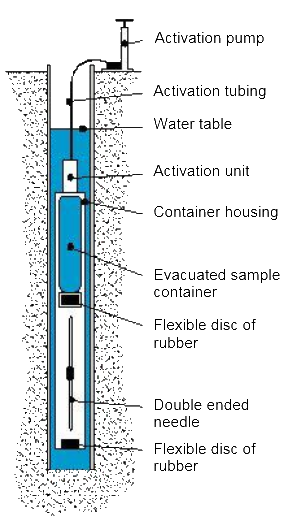 The double-ended needle then penetrates a rubber disc in the sampler and the disc in the vial cap. Due to evacuation, water will be sucked through the needle and into the vial. By opening a valve on the air pump, thereby releasing the pressure in the tubing, the vial moves upwards again and the needle is retracted out of the rubber discs. The sampler is pulled up, the vial is taken out and is sent to the laboratory for water/gas analyses. A standard GeoN Marine water sampler has a 40 meter activation tubing. For deeper sampling, a longer tubing is used. The standard glass vial can be used at a maximum water depth of 100 meters. Using steel vials, it is possible to go even deeper. The GeoN Marine water sampler is available for 35, 150 and 500 ml samples.